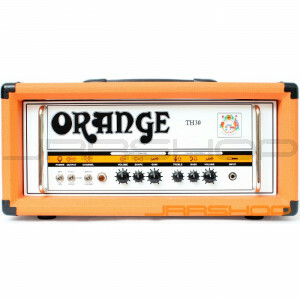 Orange’s newest guitar amp head is both the cleanest and the highest gain amp Orange has ever made. Go from sparkling Fender-like tones to metal and beyond with the twist of only 3 knobs per channel. The TH30′s Clean Channel features a Gain, Shape and Master Volume. The shape control is an EQ control facilitating a variety of tones from classic rock through to scooped metal with all variations in between. The power section of the TH30 is powered by a quartet of EL84 output valves and is rated at 30 Watts Class A. There is also the addition of a valve driven effects loop.